In the climatic scene of Shift, the hero descends a mountain to the sea. 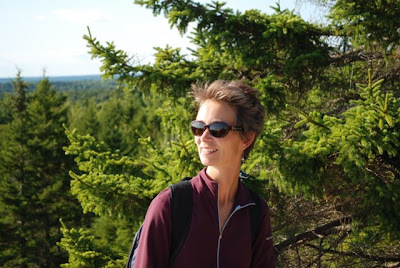 I joined the author, Charlotte Agell, on a similar if easier hike. My mission was to uncover the inspiration for Charlotte’s latest young adult novel. Shift is coming; is the world ready? Our hike was on the seventh anniversary of the 9/11 terrorist attack, the catastrophic event that motivated Charlotte to write Shift. Her fictional world is both shockingly different and eerily familiar to post 9/11 USA. It’s a book that asks, “what if?” and then dares to answer. Charlotte is my neighbor, my friend and my writing partner. I was a reader for Shift and for newer projects, and she was a reader for both Moose Crossing and S.A.D. There are some similar themes in our writing through coincidence and cross-fertilization. We are supportive of each other’s work, but we are critical too. Shift has gone through many drafts. It was not an easy book to write, but what a joy it is to read. Shift was a departure for my spiritual friend, who has written and illustrated 10 cheerful children’s and young adult books. Charlotte traded her rosy lenses for dark ones to imagines a world in which fear and coercion rule. Religious diversity and Darwinian evolution are banned topics of inquiry. Christianity is bent to the will of the state. Christ’s message of love and tolerance is forgotten. Shift is not a book against religion or God but rather a warning about the dangers of mixing religion and politics. Our unlikely hero is an ordinary 15-year-old boy, Adrian Havoc (love that name!) Adrian doesn’t want to save the world. He wants to find his missing parents and to impress the lovely Lenora, who grew up in the projects. Without a plan, the two teenagers rescue an endangered penguin from the zoo and then Adrian’s younger sister from camp. The penguin provides much-needed comic relief. 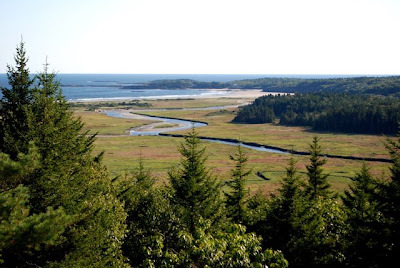 Our heroes head north across the Deadlands (Massachusetts destroyed by nuclear war) to a somewhat contaminated but still beautifully wild Maine. Rebels are hiding in the woods. The Homestate government is up to something in a mountain, but what? Charlotte and I climbed Morse Mt. 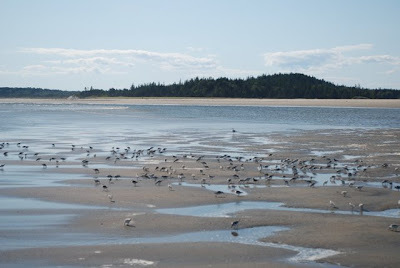 in Phippsburg, Maine. It’s really more of a hill, but the view from the summit is spectacular of peninsulas and islands on the Atlantic Ocean. On a clear day, you can see all the way to Mt. Washington in New Hampshire. 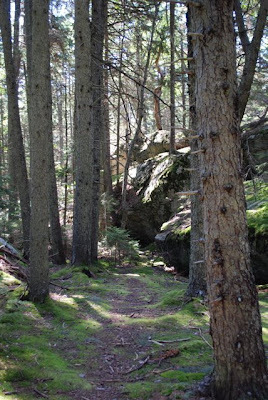 Bates College manages the Morse Mountain Conservation Area and no dogs or bikes are allowed. The hike is 4 miles total in and back, more if you walk on the beach. October is bow-hunting season, and rifle hunting season starts in November so beware. The mosquitoes are out for your blood too. It’s still my favorite hike in the area, just a half hour drive from my home. Charlotte, being Swedish, did not pack sandwiches for our picnic. She brought beets and tomatoes from her garden, Swedish flat bread and farmer’s market goat cheese. She also shared delicious cornbread baked by the librarian at the Yarmouth public school, where Charlotte teaches writing. It was a glorious, warm day with clear blue skies, just like it had been on September 11, 2001. We stepped off the path into the shaded, buggy woods. Teetering pines topped massive boulders. I could imagine a secret door in the moss-covered face. Beyond the “mountain” were the salt marshes. I’ve seen a fox and her kits there, a young porcupine (below), a river mink, iridescent ibises, snowy egrets and more. The golden rod and purple asters were blooming, enticing monarch butterflies before they fly south. We savored the last days of summer. After the marsh, the forest thinned to dune grasses. 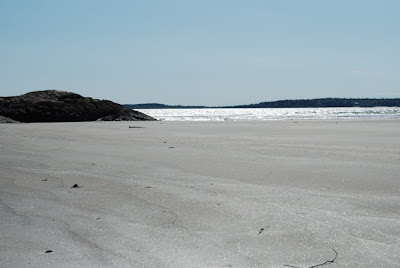 Morse Mountain’s one-mile Seawall Beach connects at low tide to Small Point and Popham Beaches. It was where I walked with my son and found so many sand dollars. 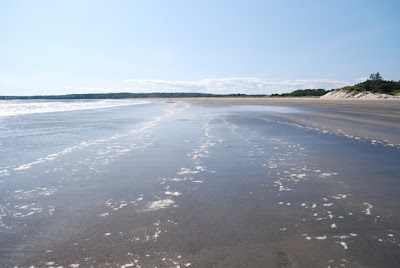 The wet sand stretches for miles, reflecting the blue sky above. 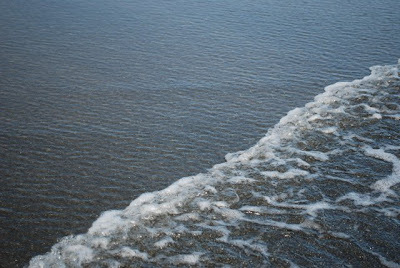 The sea really was silver; the sand was fine sugar. 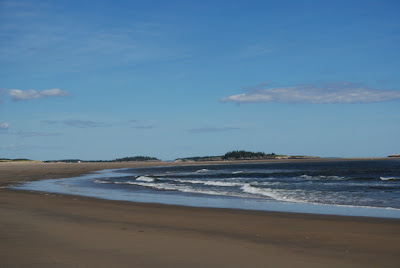 The waves rippled in gently as we walked toward Popham Beach. Other times the sea has been wild and roars like a storm. The tranquility and the emptiness were welcome. The water was biting cold on our toes, but the sun was warm. We could see Seguin Island and its lighthouse. Click on the image to enlarge it. I imagined I was Adrian by the sea, contemplating the mountain. The dangers in this world are such a contrast to the beauty. Charlotte captures both in Shift. My 14-year-old son: Shift is a reasonably quick but interesting read. The central plot is good, and the book never goes too slowly. It is particularly good in the way it describes how everything works in such a bizarre setting. I personally liked the way that I could relate to the Maine setting. It is interesting because it seems strangely similar to the current political climate, though it is a worst case scenario admittedly. Overall it is a good book that explores a surprisingly little considered type of apocalypse. My 11-year-old daughter: I like the book Shift! The characters are different and unique with strong personalities. The penguin rocks! This sci fi book, I have to admit, made me, an eleven-year-old, a little confused. However, I got the hang of it when the plot developed. I started really liking it. I love how it is based in Maine but also in the future where it rains acid and there are cool inventions. Shift is so well-written that I felt like I was there with Adrian, trekking through futuristic Maine to save the world. I would definitely recommend it to anyone. Charlotte Agell’s Shift will be released on September 30th in the USA. 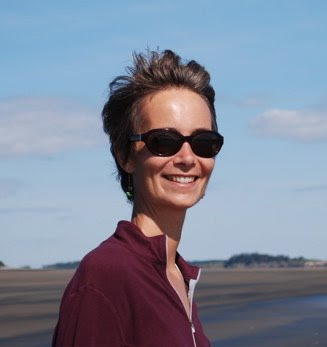 You can read more about Charlotte’s inspiration in this interview with her publisher, Holt. Brava, Charlotte! Blog Watch: Jane Green blogged about Ayelet Waldman’s fundraiser for Barack Obama. If you donate $250 or more to Obama’s campaign, Ayelet sends you a mystery bag of 10 books. The signed books were contributed by many authors (including Ayelet and Jane.) It might include a rare first edition Stephen King (Maine author) novel worth over $1,000. Here’s the link to Books for Barack. Looks like a beautiful walk and so much nature! Even the bugs. Can't have a walk in Maine without the darned things. Good luck to Charlotte and her book. Sounds fascinating. My youngest son is also fourteen. I don't know why I missed that before, but I did. We have something in common. What a stunning walk! How nice that you were able to share it with a friend. Best of luck to Charlotte on her new book! Thanks for taking us along on your beautiful authors' walk! 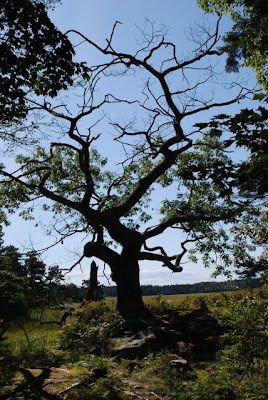 I adore that marvelous old tree! Charlotte's new book sounds intriguing. What a fascinating walk, such amazing descriptions. How wonderful that you two authors ended up as neighbors! I bet Maine has more than its fair share of the artistic types because it seems like it would attract the creative. Wow. Your photos are gorgeous! The book sounds great, I will put it on my 11 year olds list but he's heavily into the Eragon thing and there is a second book from that series that just came out. All this cross-blogging stuff is beginning to cost me because I just went out and bought a Jane Green book after reviewing her blog. I love the way she writes. But I also bought Cormac McCarthy's Border trilogy so god knows when I'll get around to Jane's. I have a friend here who is a very well known British author who I know would like to contribute to the Books for Barack. His daughter is babysitting for me this weekend and I will print something out for him. All, you might notice there is a new “followers” display in my sidebar. It allows you to follow my blog in your Google dashboard through an RSS feed either publicly or anonymously. It’s easier than adding to your blog roll. Tina, how fun that we both have 14-year-old boys. I bet he’s happy you don’t blog about him or at least not often enough for me to notice. My kids were very good sports to write a review. JAPRA, Willow and Alyson, I am lucky to live here and to have a writer friend like Charlotte. We became friends through our writing. We have 2 other neighbor/friends who write for kids and of course plenty of academic author friends. 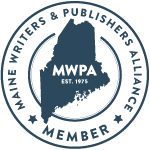 I haven’t run across women writing my genre in Maine so it’s nice to connect with writers like Jane through blogging. You have to create your community if you work at home. Audrey, Shift isn’t out in the UK yet (note to Edite: sell those rights.) Maybe your parents can send it from home for X-mas? My son loved the Eragon books too. I think you’ll really enjoy Jane’s novel for the same reason I find her voice so compelling – it’s the UK/US blend. A wonderful walk (even if Edward is rather horrified that no dogs are allowed!) and a most interesting book idea! I shall look for it. Tell Charlotte she has a lovely face! Also, thanks for the Books for Obama link. That's a marvelous idea! I loved the pics, I am intrigued by the topic the book addresses and I giggled at the main character's name, Havoc. And a fifteen-year-old to boot! Thank you for sharing your day with us. The setting looks like a place I would thoroughly enjoy. I will also be looking for the book as it sounds like one my son would enjoy. One other thing, I can also recall the beautiful weather on 9/11 - it was near perfect. Sarah, I was quite impressed with your son's review. I don't think my son has ever read a big book. He is not like me-an avid reader. And I sure wish he was. So lucky yours not only reads but writes about it. Might be like his mother? Sarah, I enjoyed "walking" with you and your friend today. You live in such a beautiful area. My brother sent me a book about the Casco Bay islands, and now I can't help but fall in love with your state. Regards Charlotte's novel: it may be closer to the truth than anyone realizes. We are just a hair's-breadth away from a scenario like that in this country. Pamela, I am sad that Stella can't walk there, but it probably explains all the wildlife. I’m sure our dogs wouldn’t appreciate a face-full of porcupine quills. I’ll pass on your comment to Charlotte and agree. ACIL, welcome to my blog! I love the music clip on your profile. A blog written by a storyteller sounds fun. I’m looking forward to reading it and catching up with your other comments on older posts. I need to write another chapter of my novel today before I get back to blog visiting. 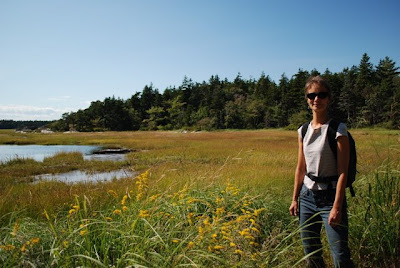 Les, I think you’d love this hike after seeing the beautiful beach and marsh walks you enjoy in your area. That's nice we have sons of a similar age. It didn’t seem possible that something so horrible as 9/11 could happen on a perfect day. I heard immediately about the explosion and watched the second plan hit live on TV. With my family in NYC, it was extra scary. We’ll all remember that day. Tina, Shift tackles the big issues, but it’s a fast read. My ARC (Advanced Review Copy) was only 230 pages. Charlotte voice is engaging and easy to follow. She teaches writing to the target age group so she knows how to reach her readers. My daughter was a little confused by the concept of realistic science fiction since she hadn’t read that genre before. She’d ask what a “telejector” was. Everything was explained in the text, but it helped to read it with her. Most 14-year-old boys would find it a fun and easy read. We are readers in my house, but our tastes vary. Shift we all enjoyed. W2W, Casco Bay is lovely. I hope you’re wrong about the scenario being likely, but it was interesting to contemplate such an extension in Shift. It was certainly a book that made us think about the implications of our current policies on the future. Such beautiful scenery--you are making me long to take a trip to the East Coast! Charlotte Agell's book sounds like a fascinating read for middle and junior high students. I've never been fond of science fiction/fantasy myself, but find books like Fahrenheit 451 or Brave New World, for example, great books to read in a literature class. I enjoyed teaching novels like these because of the great discussions they would usually provoke. Perhaps Charlotte's book will find its way into some curricula as well! Rose, I prefer literature to science fiction too. Shift is more like 1984 as it's not too futuristic. It fits into what we understand now but under a dark cloud. I think it would lead to a lively classroom discussion - I certainly had some interesting conversations with the kids about it. Thanks for the teacher's perspective on it. I just found you today. What wonderful and inspirational words. I have found here in Blogland that politics are a scathing topic. And I, being a Democrat, have not found many home and garden bloggers who look at the scene as I do. Nice to find someone who does (though your blog does not fall into that genre). I don't feel so damned alone out here in Texas, married to a doctor and hating what has happened in the past eight years! Brenda, welcome to my blog! There are a lot of gardeners in my blog community maybe because they are readers too. The protagonist of my novel S.A.D. is a gardener, so you might call me a virtual gardener. I also have quite a lot of readers from Texas. In my Blog Roll are Bee Drunken and Just a Plane Ride Away, who are from Texas but live in England. Blogging is great for finding pockets of people who share your interests. I’ll come visit yours. 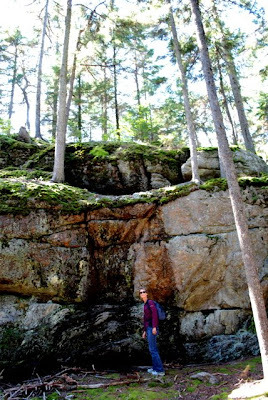 PG, Maine is as wild as England is cultivated. Both are lovely. 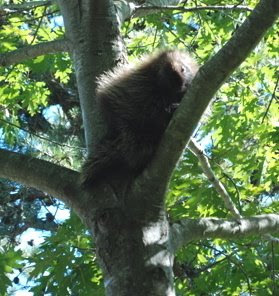 I have never seen anything as cute as this young porcupine climbing the tree. Imagine a stuffed koala bear, only less cuddly. Usually you just see them sleeping up high. I had missed the sea living in Oxford, but now I miss the river. Sarah - Thanks for the introduction to Charlotte and for taking us along on your walk. The porcupine looks cuddley, although I know he is not. And I love the photo and description of the oak tree. Scenic and amazingly tranquil. It must refresh the mind to walk in the woods so. There must be lot of wildlife around where you live. Cindy and Anil, I’m looking out my window at the drizzle and fog, and the hike is already a special memory. Maine has such beautiful scenery and wildlife, but my town isn’t that different from many towns in the USA. I'm a great admirer of M.Atwood and asked her if she had ever been to an English girls' boarding school....she manages the feeling of oppression so well. I'm just reveling in things English and go back to NY next Tuesday. What a fabulous trip, Sarah. Charlotte's book sounds facsinating too. I was very interested in your comments about the dangers of mixing politics and religion. I think that Some of America is veering down an incredibly intolerant path -- and that is very contrary to what America is meant to stand for(constitutionally and symbolically). I admire Charlotte for tackling a difficult, dark subject; and I look forward to reading her book. It is also important,though,to shine a light on all the many beauties in the world. You, of course, did an admirable job of THAT with your beautiful photographs. "From sea to shining sea . . ."
The Obama fundraiser is clever! Is it too tacky to suggest that Obama probably has more readers in his camp than McCain does? really enjoyed reading about your hike and the new book charlotte has written. hope it does well for her. Elizabeth, I’ve been enjoying your posts from England. Jan, I do find solace in nature. Bee, that’s a really good point on America’s founding values. All, I just read on Galley Cat (publishing industry blog in my sidebar) that Ayelet’s books4Obama was such a huge success that she had to close shop. Galley Cat would have posted about author group efforts for McCain, but they hadn’t heard of any. Politics tends not to be a topic of this blog unless it relates to books. I want all readers to feel welcome. I’m used to different political opinions in my family. Sarah, how nice for you to have a good friend who is also an author, with whom you can share opinions! 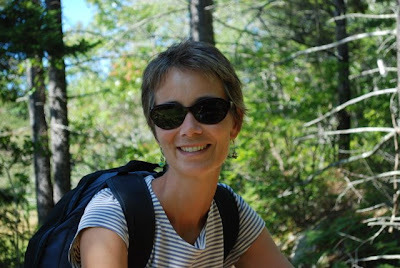 A Swedish author in Maine...how interesting! Katarina, I thought the Swedish connection would interest you. Charlotte has also lived in Canada and Hong Kong. 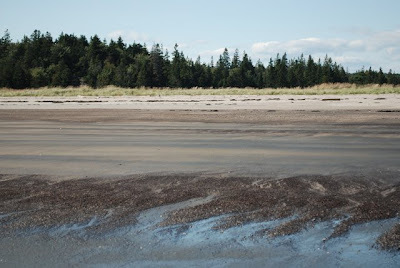 She came to Maine for college and fell in love with both the state and her husband. I forgot to ask the most important question when I was here last: how do I get 'Shift'? Your mention of 'The Handmaid's Tale' (my favourite book by Atwood) caught my attention. Also, may I add your blog to my links? ACIL, Shift will be released in the USA tomorrow Sept. 30th (you can buy it there through a bookstore or Amazon.) The publication rights have not been sold to the UK yet. You can add me to your blog roll, thanks. I’ll add you to my ex-pat blog roll as I appear to be collecting them even after leaving the club. My new novel is about expats in England so I'm virtually still there. UK readers, it looks like you can order Shift through amazon.co.uk as of today.